Place all the ingredients in the work bowl of a food processor or chopper and pulse until the mixture reaches the desired consistency. Taste and adjust the seasoning and hot sauce as needed. 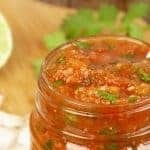 Salsa can be stored in a tightly covered container for up to 3 days. For best flavor, remove from the refrigerator for 30 minutes before serving. For best results, place the canned tomatoes in a strainer and press the liquid out with the back of a spatula or large spoon.